Ahhh... There's nothing quite like a good night's rest in a beautiful, clean, and organized bedroom. It's one of the most personal spaces in the home and should be a welcoming, safe retreat from the outside world. you enjoy this month's newsletter as it focuses on these important areas in your home. By the time you're 75 years old you will have spent 25 years sleeping, if you average 8 hours a night, or 22 years sleeping, if averaging 7 hours of sleep. 3. Only keep your "A" team or current clothes in your main closet. Shift seasonal clothes, maternity, and "other size" items to another storage space, such as under your bed. Many people can reduce the amount of clothing in their closet by half if they follow this guideline. 4. Purge a little more. Once you have everything sorted, you may discover that you own multiples of the same item. This is your chance to get rid of those items that don't fit, are out of style, or are not practical. (From here on out, keep a give-away box in your closet to make donating easier.) 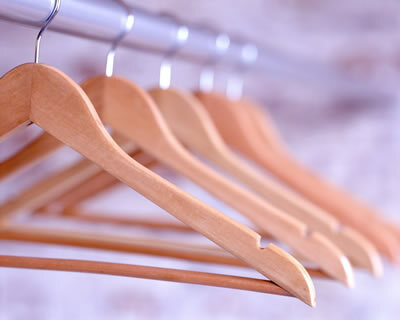 Remember, it's important to let your clothing have a little breathing room to keep it wrinkle-free, as well as to allow you to easily view your closet's contents. 6. Return clothing to the closet. Organize your clothes to work with your lifestyle. Section garments by type, then by color, so you can always easily see what you have. Hang pants, blazers, button-front shirts, dresses, and skirts. Don't put matching tops and bottoms together, since this stops you from seeing other ways to combine them. Arrange clothes so those you wear most often are nearest the front of the closet. 8. Assign each item a "home." Designate a shelf, section of rod, or drawer for each category of clothing. You're likely to return items to this space after every use. Come up with a system that will allow you to maintain the de-cluttered space with minimal effort. Also, install adequate lighting that will allow you to view all of your clothing and shelf space. So you've cleared out your closet and you have a pile of clothing - some of it nearly new and in great condition - that you're never going to wear again. Did you know that donating your business attire could change someone's life? Dress for Success (for women's clothing) and Corporate Code (men's clothing) are two organizations whose core mission is to promote the economic independence of disadvantaged men and women, beginning with providing professional attire for job interviews and the workplace. Visit their websites for information on how to donate clothing, organize a clothing drive, or volunteer your time. Students benefit greatly from a dedicated, organized space for homework and studying. Here's a quick "Before & After" from a recent teen bedroom organizing project . A great perk was finding almost $500 in cash and gift cards as her room was de-cluttered and organized! Shelfanator - Covers wire shelving in closets and pantries. Ingenious! Spacemakers Home and Closet Organizing - Custom solutions for every area of your home and office. Email Teresa Safranek, Senior Designer (Atlanta, GA), for a free estimate or call 770-318-9613. Triple Laundry Sorter - Keep one in the closet or laundry room and sort dirty clothes as you go. Elfa Closet System from The Container Store - Designed to your specifications; you install or can be installed for you. Hurry...30% off Elfa sale ends February 15! Closet Rod Organizers - Divide your clothing into groups for quick access. Shelf Dividers for solid shelves - Keeps clothing neat and tidy. Easy Hang Shoe Rack - Turn an empty wall into efficient shoe storage. Stacking Jewelry Trays - Comes in a variety of sizes and shapes - perfect for inside drawers!